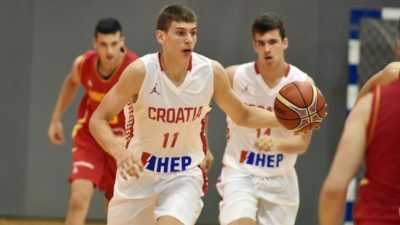 As Croatia rose to the gold medal thanks to the top player of the event Roko Prkacin, numerous prospects had the opportunity to showcase their skills in what seems to be a star studded class. The do-it-all forward was just too good for his opponents. At 6-8, Prkacin can handle the ball, drive or play the post up game. He displays good athleticism and length, and a good bball IQ which could him develop into a point forward. His main weakness is his shooting as he averaged 16% from three, a field he really needs to improve. His length could also help him become a better defender on the passing lanes. The Spanish Freak still is too advanced physically as he finished top rebounder of the competition and played with the opposition around the rim. He still has a ways to go to develop a more versatile skillset offensively and will need to play more as a four as he seems to be done growing and will lose a part of the athletic advantage he has now when he will play against grown men. He had two games when he hit two three pointers, an encouraging feat for his development. A long and skinny forward, the Real Madrid’s prospect is already playing the same style of basketball which could make him a pro. At 6-6, he averaged 18pts on 43% 3pt, 5rbds and 2.7as, displaying the ability to handle the ball and create for his teammates. He has to gain strength and grow into his body to be even more efficient athletically, yet is someone who we’ll keep an eye on in the future. For his first official competition with the French NT, the top 10 sophomore prospect in the US proved he was already efficient averaging a double double in 26min. However, Diabate is far from being a finished product and needs to improve almost everything in his game, from his moves around the basket (45% 2pt) to his outside shooting (55% ft and only one 3pt made) and his defense as his 0.6blk per game is pretty low for someone with his physical tools. At 6-6 with solid length and athleticism, Grant is your prototypical 3 and D forward. The top scorer of the tournament already plays the same way he will be asked to enter the pro rotation with Bayern Munchen, averaging an impressive 38% 3pt with six attempts per game and solid defense with 4.7rbds, 1.6blk and 1.4stl. French prospects are more known for their physical tools than for their shooting, yet Begarin brings the best of both world. At 6-4, he’s a hard-nosed defender who finished top 5 in the thief category with 2.3stls per game. On offense, he’s as good driving to the basket as he is shooting from three with 41% 3pt on 5+ attempts per game, allowing him to average 15.6pts per game, good for 8th in the scoring category. He will try to translate this experience with Centre Federal in French 3rd division. Tubelis is one of the reasons it’s so hard to evaluate such young prospects. At 6-7, the Lithuanian forward scored mainly inside, hitting only one three point in the tournament. He was dominant on defense with 10.4rbds and 2.7blks, good respectively for 3rd and 1st in the tournament. Yet, he won’t be able to be as dominant if he doesn’t develop a reliable outside shot or grow significantly in the years to come. Sengun may not be your ideal NBA prospect as he’s more of an old school, heavy center who mainly plays below the rim. Yet, his advanced game helped Turkey reach the third place with 14.4pts on 61% 2pt. He was also active on defense with 1.4blk and 1.6stl. He will need to work on his shape and his outside shooting as he averaged a low 48% from the free throw line. Görener was as important his teammates as he led the outside scoring with 14.4pts on 39% 3pt including 6/12 against France. At 6-8, the Turkish forward has the size and shooting to develop as an efficient scoring forward with Montverde, his new team for the coming years. The US game will help him improve his defense and intensity. The tallest player of the competition, Levy made his presence felt…when he was not bothered by fouls. Of course, he needs to grow into his body, develop a stable offensive skillset but has been very efficient with 68% from the field. Levy is a pretty good athlete for his size and age and has decided to move to Movistar Estudiantes where he will play in the high level Spanish junior championship. Why adding to this list a player who averaged 2.3pts? Well, the 2003 Bona is a 6-9 and still growing inside player with a big wingspan and nice athletic tools. His 5.7rbds and 1.3blk are already very good considering his playing time of 13min per game. He’s very raw on offense but if he can emulate players like Capela or Gobert, he could be a real force for the Turkish team. Next Next post: NBA offseason moves : Lebron to LA, Kawhi to Toronto, who can chase the Warriors?